Just Bing it! – Start Bing’ing the Internet! 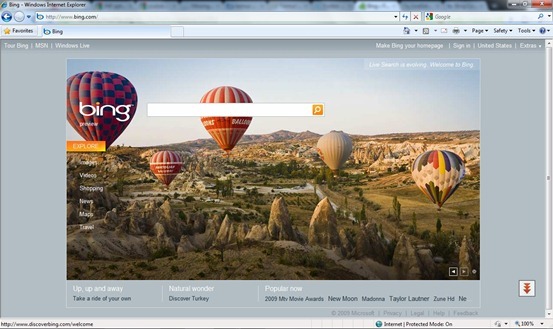 June 1st 2009 marks the day when Microsoft has officially launched a public preview version of their fresh new “decision search” engine called Bing. Bing.com page is both catchy and attractive. The biggest & the most important question here of course is that whether Bing can produce better or even equivalent search results to Google? I will have the final say on this in the upcoming days when I have done enough testing with Bing to compare it with Google Search. The Live Search service is still up at live.com and will be completely replaced by Bing when it is fully launched later this year. i like my hous at de lake. if i come hume i will bing my girlfriend harrd. Live Search has now completely gone now. I love Bing when I go to use Google I go to use some of the features in Bing and remember they are not there. Bing is amazing and I will never go back to Google.